Starting from a clean slate with my move to my own apartment gave me the opportunity to buy in a few new ecosystems. One of those systems I fully delved myself in is Philips hue, a smart and connected light bulb. Or at least, that’s how the buzzwords describe it. 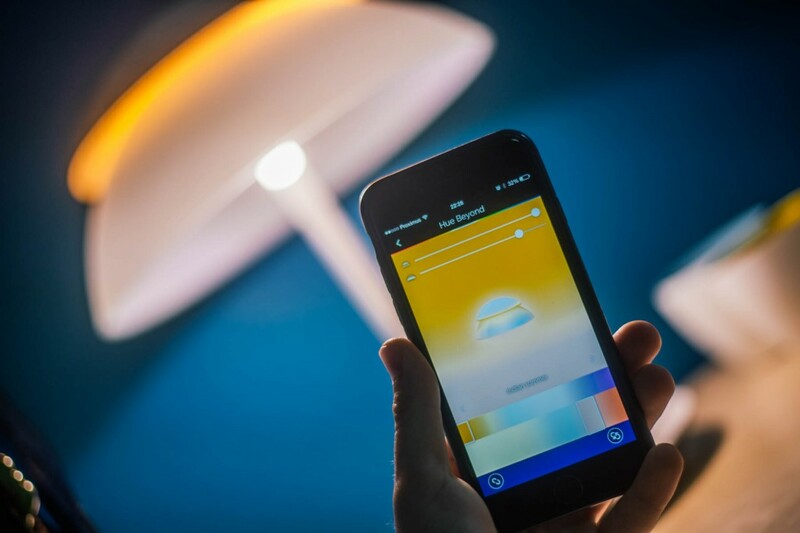 One of hue’s strengths is the capability to change colour and intensity on a whim, from the self-powered Hue Tap, or even on the other side of the world with a plethora of apps on smartphones, tablets and computers. Each package from hue is a dream to unpack. Easy to open, the products are easy and logical. Just connect the dock, screw in some bulbs and fire up the app. A glowing ring around the big button on the dock authenticates any app you want to grant acces, and you’re set! For €199 you can get the nice deal of three hue bulbs and a dock. The dock, unlike some others, is an essential item, coordinating the communication between your plethora of lights and your router. In our medium sized house we didn’t have any problems getting the lights to connect, and in our smaller apartment everything works fast and smooth. When I installed the first set last spring in my old house, the router sometimes had issues to connect to the way other side of the house, but a firmware update fixed that. The bulb (€59.99) itself is a nice tapered design with a huge glass diffuser dome. The materials have a premium feel and a decent weight to it. These ain’t your Dollar Store LED’s. As soon as you turn on the lights a nice warm glow comes on. This is the default state for a bulb. It will not remember the last state it was on. A standard light temperature would be nice. Some colours are easier to replicate than others. For example, green seems very hard to get just right, while the red and blues do wonders. What I don’t like is the size. Because it’s a large light it can be hard or downright impossible to fit it into some lamp shades, which is a shame. At first, I only used the standard light recipes with warm and cool shades of white, to avoid it looking like a 60’s party. (Though I do have a light scene that gives every light their own color, aptly named disco). Recently I have added some more liberal colour choices, like a slight purple as a surround light, with a soothing orangey-yellow as the key light and even going as far as lighting the living table a soft red, which is even more surprising that as a photographer I outright hate red light. But it all looks great! One little point of critique, when the lights are not active, but plugged in, they emit a high pitched noise. Not always audible, but when it is, it’s annoying enough to turn on the lights. But that might just be my sensitive ears. 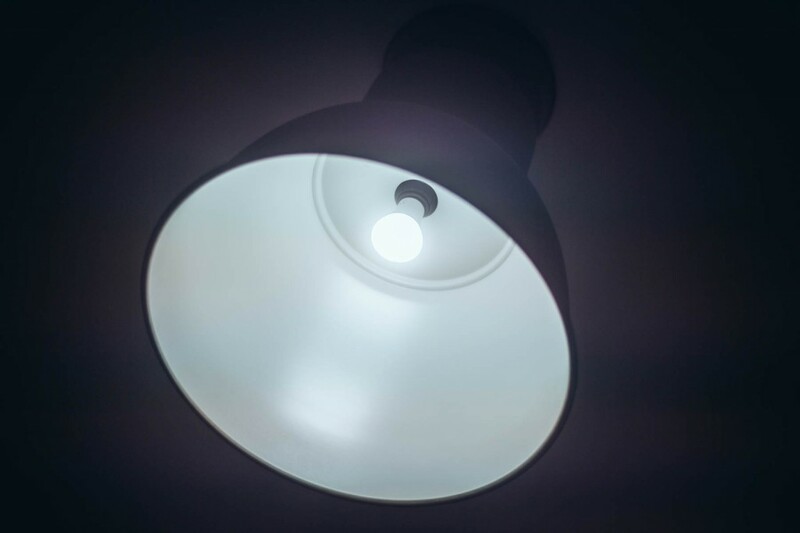 When the hue lux bulbs were announced, the rumour came out that instead of all the millions of colours, it would offer just the complete range of cold to warm shades of white for a cheaper price. Unfortunately, all it offered was a dimmable warmish shade of white, working together with the controllers of the hue ecosystem. I have two lux lights in use. One in the hallway, and one lighting the toilet. The 2700k light gives out a bright light that looks cool enough at day, yet warm enough at the evening. But for the still hefty price, I still would have loved the warm and cold shades of white. Recently announced is the hue Beyond. The lamp with integrated LEDs comes as a ceiling, pendant or table lamp. I chose the latter to compliment my IKEA BEKANT standing/sit desk (review coming soon). The beautiful design truly comes to live when the lights are glowing a color. There is a top and bottom part of the light, which can both be individually controlled. The app gives option of adding the lamp to existing scenes, or just pick separate colours from some gorgeous colour mixes. The heavy light is made of sturdy materials, and has a real premium heft to it. The bottom light scale is made of glass, while the rest seems to be made from an ABS-like plastic, mixed with a lot of metal parts. The cable has an appropriate length, and looks absolutely great. 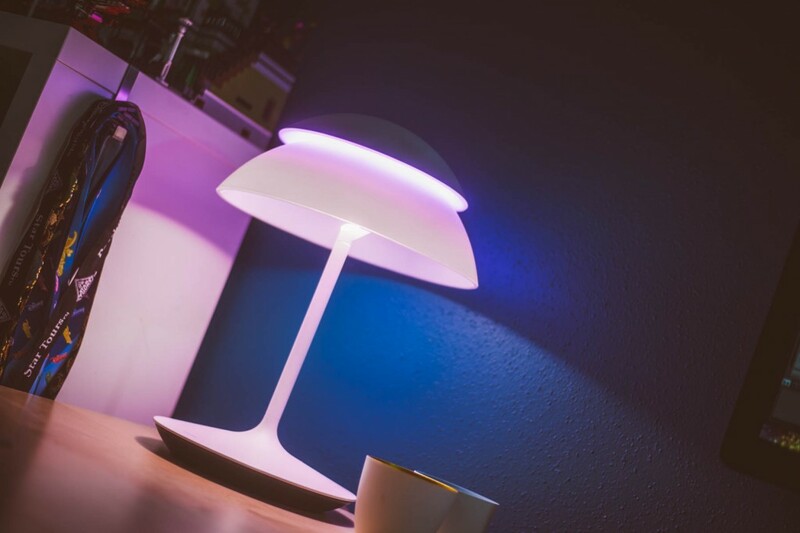 While looking for a great desk light that is compatible with hue, I can only say that the higher price is completely worth it for me. The Friends of hue Lightstrip is a €89 hue controllable lightstrip. Offering two metres of RGB LED’s it manages to give intense colours, yet it lacks the two white LED’s, making it hard to replicate white colours. The fact that you can’t incorporate those lights in light recipes makes it another annoyance. Basically it’s a regular Philips LightStrip with hue connectivity. Even more frustrating is that though you can trim the strip to size, it seems it’s almost impossible to re-use any leftover bits, though I’m sure my electronic technician friends could work some magic. If it weren’t for the high price, I would be using quite a lot of these in the house to give some extra indirect light, such as two strips on either side beneath the bed, or on the backsides of my closets or above the curtains. But for now its only use is to light my kitchen counter. These are the only light I don’t have, since I don’t have a place, nor a use for it. The LivingColors lights are another €89 hue upgrade of existing lighting accessories. You aim it at a place, and it will give out RGB light, just like the LightStrips. Reason I don’t have one? My main wall already is Scandinavian blue, any color on there would just be clashing. If it wasn’t for the high price, I’d get another one (sense a pattern with the Friend of hue list?). This basically is a Bloom, but battery operated. A full charge will last three hours of continues light. Brand new, the Phoenix is a series of five integrated lights, just like Beyond. The only difference is that these only offer all the the warm and cold shades of white in pre-made fixtures. Personally, I’m not convinced by the design, but the idea of all possible shades of white is something that I would have loved to see in the hue lux series. The clickety €59 wireless wall switch is a bit of an odd-ball. Giving 4 mechanical click buttons are a bit much for visitors just looking for the bathroom light switch, but once you get used to it, it’s a great way to switch on a light scene. I have three in use, all programmed with the same idea behind it. All off. Great for when leaving home and ensuring every light is off. All lights off in the living room, activate lights in hallway and toilet. ‘Relax lights’: Key lights in the living room active with Relax living light. Might be replaced with my purple set. ‘Kitchen’: Activate light strip on kitchen counter, and all lights around the kitchen table. All lights in the bedroom and bathroom area. ‘NightNight’: a relaxing shade of purple and orange in the bedroom. Ever since I installed the hue spots, I used white gaffer tape to permanently activate all the light switches that lead to the hue bulbs. If a guest where to accidentally turn of a light, it can take a bit to figure out why my light doesn’t turn on when I push the button on my tap or remote. Is it the network, the bridge, the light, or the switch? The first weeks I’ve kept reaching for the legacy buttons, and the bit of tape helped me to remember. Each time I have a new guest over it takes a few times, but they all are impressed with the system. It has happened once or twice in the past year that one tap sometimes seems unresponsive. My fix has been to just re-add that tap, making it suddenly remember that it’s already part of the house. But it might just be a single defective unit. Other taps are working great. 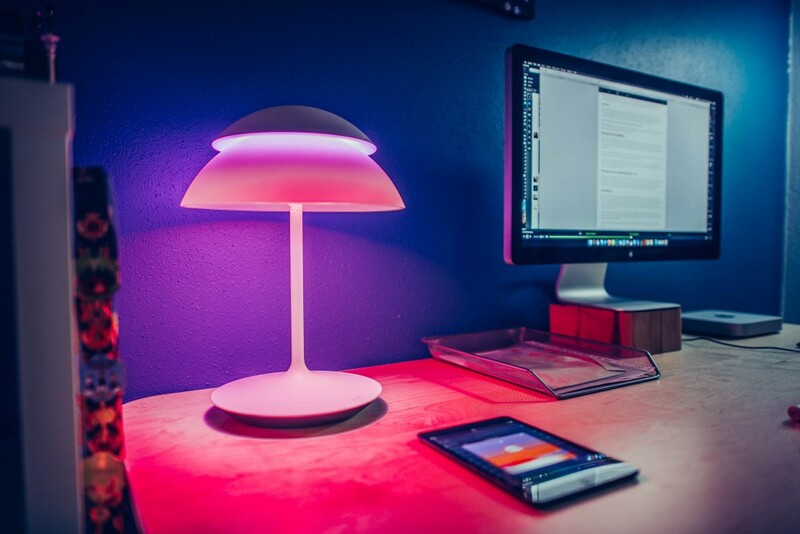 Since Philips opened up the hue API to developers, there have been a lot of apps creating fun and creative ways to operate the lights. I am using the hue app on my iPhone 5 S and iPad Mini. For this review I will focus on the iPhone. I’ll be blunt: The stock hue app used to be crap. But I found with the latest updates I prefer the stock app over many alternatives. There is room for improvement though: syncing could be much more robust and controlling multiple bulbs could be a bit easier than dragging in a group and moving that group. An update with iOS8 gave us widgets, so my favourite scenes can be always be accessed. 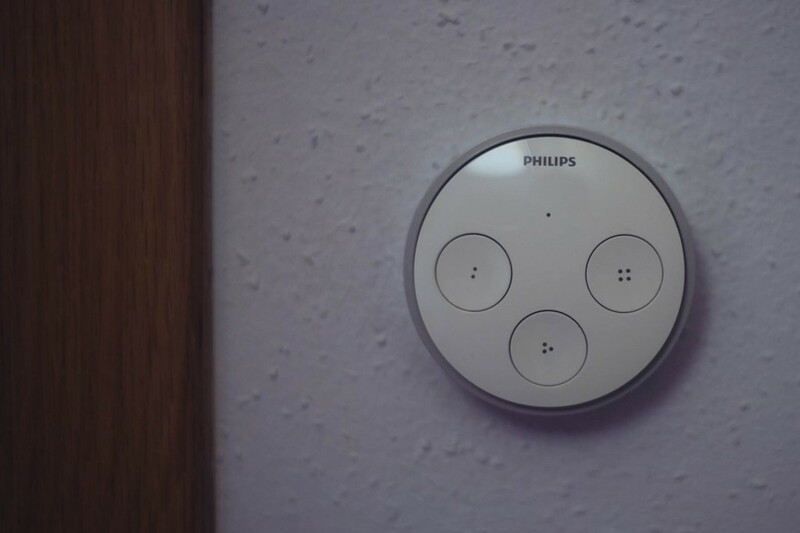 Webservice If This Then That offers complete hue integration, making it possible to turn on your lights blue if it’s going to rain, flash bright red when your Nest smoke detector senses danger, or even change your living room mood to the colors of the winning soccer team. Or even a flashing bathroom light when you get a Facebook notification. All gimmicks aside, it is nice to set up that at 3AM all lights automatically get switched off, or that lights come on at sunset. (Though I would love an option to offset that, so thirty minutes beforehand the lights slowly come on). Calculating my hue starter pack, five loose E27 bulbs, two lux bulbs and three taps gives me a grand total of 829,4 euro. This for a one bedroom apartment. Buying ten regular Philips LED bulbs would have set me back only 10% of that investment cost. So, is it worth that investment cost? Yes, I believe so. The possibility of switching on and off lights, everywhere in the world (when connected), in any color or intensity that I feel like, in sets is an amazing feature. If needed, could I live without it? Sure, but even as I’m sitting in an other living room, I already wish I could change the color. In the two years that hue has grown from just one kind of bulbs, it has grown into a major ecosystem that seems to be ever expanding. In fact, at CES 2015 Philips has demoed smart sensors talking to hue. To quote Futurama: Shut up and take my money.